Team Cuba displayed sufficient offensive punch but the bullpen ultimately failed to deliver in the clutch as Victor Mesa’s squad dropped a Monday afternoon 6-5 decision to the Host Taiwan WBC roster at picturesque Kaohsiung Stadium. Things opened well enough as Alfredo Despaigne broke the ice with a ringing center-field homer off Taipei starter Yao Lin Wang in the top of the second frame. The see-saw battle that followed witnessed three lead changes before Cuba took the advantage in the top of the sixth on an infield single by Alexei Bell, a run producing double by Eriel Sánchez, and a sacrifice fly (scoring Sánchez) off the bat of Guillermo Heredia. Cuban starter Ismel Jiménez worked four successful shutout innings (3 Ks, 2 walks and a pair of base hits) but Mesa’s initial reliever Leandro Martínez surrendered a three-run homer to DH Yi Chuan Ling that propelled the home club into the lead in the bottom of the fifth. Mesa would subsequently use a full bullpen contingent of Yander Guevara (who worked successfully in the sixth), Norberto González, Rasiel Iglesias, Wilber Pérez (who gave up the tying tally in the seventh), Diosdani Castillo and Alex Rodríguez; Guevara was solid but the remainder worked with with mixed results. 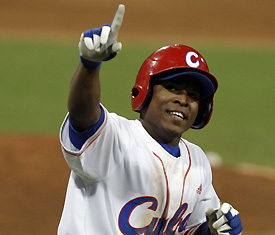 Castillo (the loser) loaded the bases in the home ninth and Alex Rodríguez subsequently walked in the winning marker. Alexei Bell (three hits) paced the Cuban offense in Monday’s opening Taiwan exhibition match. The Taipei exhibition series moves on to Taichung on Tuesday afternoon where Cuba will square off with Australia in a 2 pm (local time) televised match-up.